Join us and enjoy stylish living in Fort Worth. Charming brick buildings complete with a Spanish tile roof welcome you to Verona Apartments' villa-style community. Oversized windows with views of the professionally landscaped grounds, native trees, and blue skies over Fort Worth make it easy to bring the beauty of the community indoors. 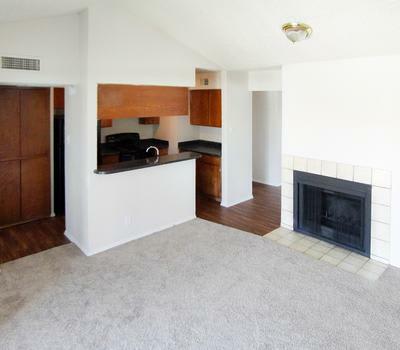 Apartment homes for rent range from 530 to 1,033 square feet, with one or two bathrooms, walk-in closets, and fully equipped kitchens. Extensive storage space and four unique floor plans offer the perfect layout for everyone. Distinctive layouts, ample living and storage space, and quality features designed to make life easier is just the beginning inside your new one or two bedroom home at Verona Apartments. We’ve also included generous amenities for style and comfort, such as vaulted ceilings, walk-in closets, and a kitchen pantry in every home. Your living space extends into the outdoors on your private balcony or patio, which has enough space to relax as the stars come out. If your ideal way to spend a cool evening is relaxing in front of a fire, you may choose an upgraded home with a cozy wood-burning fireplace. Explore the one and two bedroom homes at Verona Apartments. View the floor plan models and then call us to schedule a personal tour of the home that works best for you.